China (FDCs). 1997 Stone Carving (SG MS4220). 1997 Sport (SG MS4226). (Good Condition ). The Beauty of Putuo Mountain. SG 4371 to 4376. 1999 issue. (Further information on the back of the covers). C004 China 1958 Block 6 gestempelt C50 700. 10-12 und 13-17 Uhr. siehe scan. T38 Souvenir Blatt. plus 6 Briefmarken (T38). Chinesische Mauer / Great Wall. -sehr guter Zustand. "An- und Verkauf". Ancient Temples in Wutai Mountain. 1997 issue. Mint - never mounted or hinged. Set of 1 value (1v Set): 1.20 x 4, 1.50 x 2. You will be back for more! (Sheetlet with 6 values (6v M/S): 1.20 x 4, 1.50 x 2. 3) Select each item and 'Add to Basket'. British censor label 4576 at left. China FDC Mi Nr. 2046 - 2051 auf 6 FDC Karten. Denomination: 860 fen. Printing process: Offset. Date of issue: April 21, 2013. 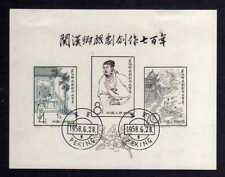 RARE PR China Used sets for Stamp Collectors - A. Set of 3 - unused. The original stamp does not have this line. Cost is £2.00. ALL with faults for Space Filling. 6 x Cina; 3 x Taipei; 1 x Macao COPERTINE primo giorno; 1996. vedi FOTO PER INFO. "Artisten/Akrobaten". 6 x Briefmarken. "An- und Verkauf". Size of sheet of 2: 150 204 mm. Size of S/S: 120 80 mm. Date of issue: July 28th, 2007. Technical details Serial number: 2007-20. Bonzai Landscapes. SG 4090 to 4095 inclusive. Cina 1984 FIORI ROSE cinesi set di 6 Nuovo di zecca never hinged. SG3304/3309. Bought as a New Issue in 1984 and been in an album ever since. P.R. China. 6 CARTOLINE inutilizzato. (pre-pagata). 1997-1999. Chinese Dragon Artefacts. Excellent condition complete with the official informative folder. 2000 issue. RARE PR China Used sets for Stamp Collectors - C.
1 Piece of 2c Pinkish-Red Used (Photo 1, 6 and 7). 1 Piece of 2c Brown Used (Photo 1, 6 and 7). 1 Piece of 80 Cash Light Brown Used (Photo 1, 4 and 5). 1 Piece of 80 Cash Green Used (Photo 1, 2 and 3). China No. : J.172. Date of issue: 22 September 1990. No Exclusions.